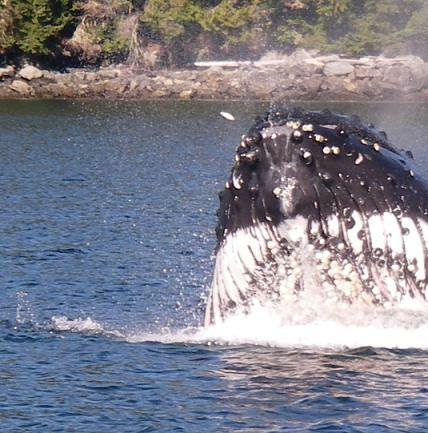 That is the underside of a humpback whale’s lower jaw as it lunges out of the water with a mouth full (minus one) herring. Getting into position for the picture is easier than getting the picture. As a guide I keep a look out for diving seagulls, which gives me the location of a herring ball. Next you try to get close to the herring ball before a humpback whale beats you to the herring ball. After that it is a matter of waiting for the gulls to lift off the water just before the whale lunges. My job is complete all the guests needs to do is have perfect timing and an excellent eye mixed with luck. My photography relies mostly on the luck. Grizzly bear tours from the lodge leave about eight o’clock in the morning and travel for an hour and a quarter up Knight Inlet. Once we reach Glendale Cove we transfer to a 5.5 meter (yard) skiff that has a shallow draft permitting us to move close to the shore and up the river. Once we are in the river your guide gets out of the boat and starts to pull it quietly up river in the shallow water. 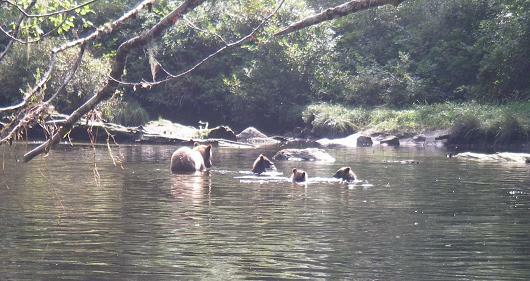 When we first see grizzlies we go to the riverbank to wait and to determine which direction the bears are moving. This was a photo I took with my small camera while waiting. When it was safe we moved up river much closer to the bears and the guests obtained some good photos but I was to busy for more of my own. When you are in the wafer it is not good to have a camera in you hands if you decide it is necessary to move the boat. This is a great site to visit to get a “guest eye view” of a trip to our lodge. Also: -if you search “You Tube” using the keyword SAILCONE you can view some videos from and about the lodge. Look to the left and scroll the sidebars to “Categories” and select “Wildlife Tour Itinerary” It is possible to navigate the map using the arrows in the upper left corner and to zoom using the + or – signs as well as changing to a satellite view in the upper right corner of the map. It is possible to navigate the map using the arrows in the upper left corner and to zoom using the + or – signs as well as changing to a satellite view in the upper right corner of the map. 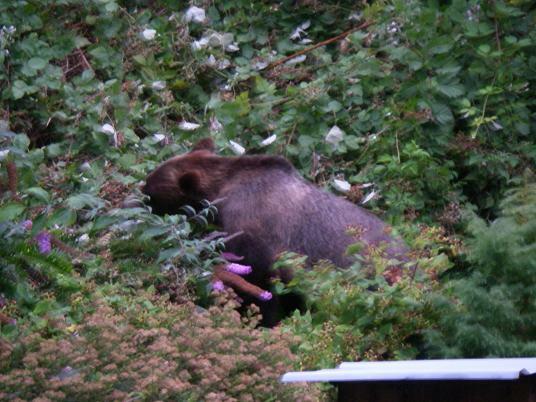 This grizzly bear is enjoying the berries from a back berry patch. Now that is not too interesting until you notice the metal roof in the lower right corner of the photo. This is the roof of the smokehouse that is 5 meters (yards) from the back door of Grizzly Bear Lodge and that grizzly is in our black berry patch. This became a problem and it took close to a week of very alert guides and guests until we made enough noise and believe it or not threw enough rocks to scare the bear off our island. The bear population in Knight Inlet is growing so the bear are starting to move out the inlet and even crossing Johnstone Strait to Vancouver Island. In the spring it has become more common to view grizzlies on the larger island around the lodge. There have been grizzlies on the lodge’s Minstrel Island in the past few years but the island is small and they were gone after a day. The extra day at Grizzly Bear Lodge is normally spent on the Kakweikan River with Trapper Rick. This is a “wild river” in that it is hard to access and only our lodge visits Rick while the scenery getting to the river and at the river is “magnificent” (quote from a guest). The day involves short hikes; salmon fishing on the river if interested, and time with Rick looking for grizzly bears. This day the guests were below the falls at Rick’s cabin watching a grizzly on the opposite side of the river. The grizzly bears come to this area to fish at the entrance to the salmon ladder that was built by the Department of Fishers about twenty-five years ago. It is a unique experience viewing grizzlies from the opposite shore of a river and not being in a viewing platform. Rick known the bears in this valley and has a great deal of respect for them and safety over pictures is his rule. “Humpback whales (Megaptera novaeangliae) migrate between high latitude summer feeding grounds and low latitude winter breeding grounds. In the North Pacific, winter breeding grounds are known in waters off Japan, Hawaii and Mexico; summer feeding grounds are found in coastal waters of Alaska, British Columbia and the western mainland United States. Researchers use photographs of the ventral surface of the tail flukes to identify and track movements of individual whales and to estimate abundance. Patterns of pigmentation, scarring and shape of the flukes are unique to each individual.” From Fisheries and Oceans Canada website. 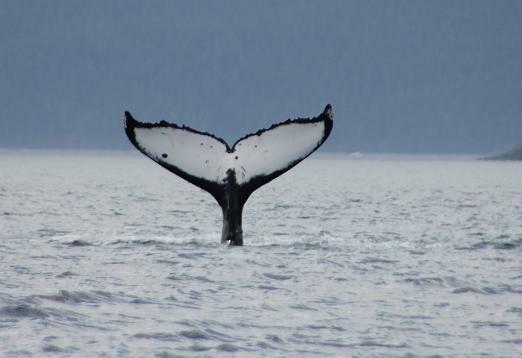 Over the past five years more and more humpback whales are spending the summer in the area near Grizzly Bear Lodge in Knight Inlet so that it is common to see more than a dozen whales on a days whale watching safari. As we stand in the viewing platform overlooking the entrance to the spawning channel the grizzly bears are often only 20 to 25 meters (yards) away from the camera lens. The bears have accepted our presence and although they generally ignore the stands at times they let us know they know. This bear spent several minutes glancing our direction that is why it is important to make sure flashes are turn off and there is not sudden movement or load noises. After all we are the guests and this is their home. The grizzly bears of Knight Inlet’s Glendale River spend a great deal of time in the river estuary before the salmon arrive. In the spring and early summer they are feeding on sedge grass and turning over rocks along the shore to enhance their diet. When the first few salmon start to arrive in mid-August the bears are in the lower river that we are able to access with our flat bottom shallow draft skiff. 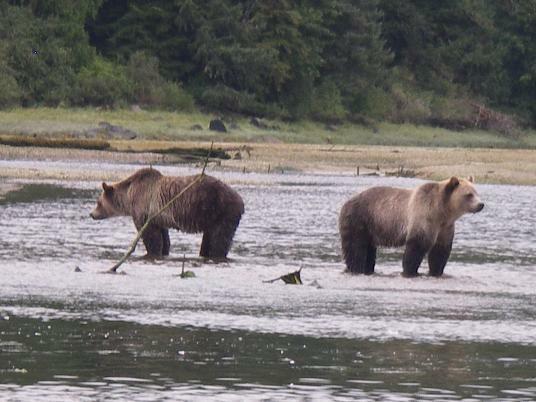 These two grizzly bears seem to be on guard looking for the few salmon that are starting to enter the river. Back to back they have the full 360 degrees cover to make sure they spot any salmon trying to get up river. 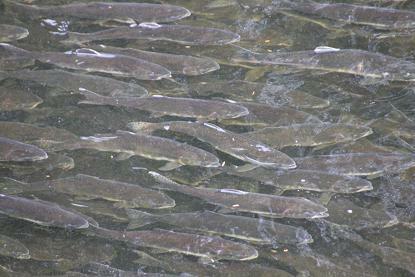 This photo was taken from the viewing platform on Knight Inlet’s Glendale River. The grizzly bear tours from Grizzly Bear Lodge use the platforms after August 24th on our tours. 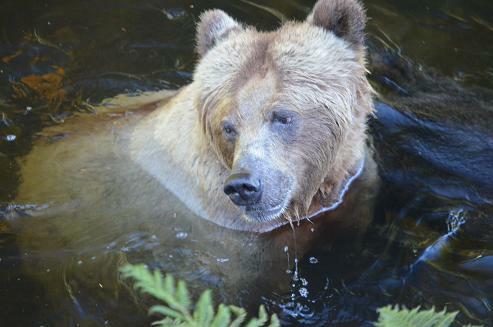 The abundance of salmon is “the reason” the grizzly bears come to the Glendale River, the reason we go to the Glendale River, the reason we have guests visiting our lodge and likely the reason that you are reading this post to learn about Grizzly Bear Lodge. I have been guiding at the lodge for fourteen years so come and join our family (staff) I am sure you will enjoy yourself. 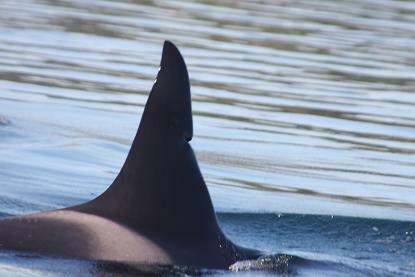 The killer whales / orca along the west coast of North America are identified by the shape and size of their dorsal fin and the saddlepatch located by the fin. Other distinguishing marks are also a great help especially the notch located in A72’s fin. 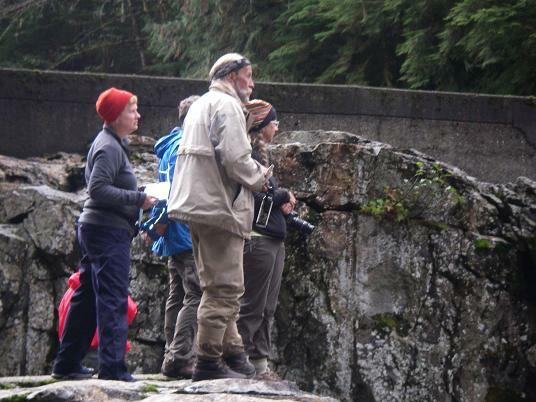 I have found over the years that our guests are less interested in “who” they are watching and more interested in “that” are watching killer whales. This is the reason to park the boat in the area of a bait ball but not on top of the ball. A humpback whales is very aware of its surroundings but I do not wish to test their awareness with the bottom of my boat because I think we might lose. 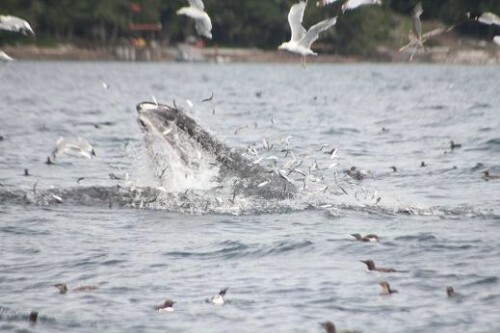 Although it appears that this lunging humpback missed many of the herring it must have got enough to satisfy itself because there was not a second lunge.